GREENFORD–The South Range softball team fell to Cardinal Mooney 8-5 on Friday. The Raiders drop to 8-4 overall. Bree Kohler smashed a pair of home runs for South Range, while Julie Centofanti doubled and singled. The Raiders are back in action Monday at home against Struthers. CM–Maddie Silisky (3IP, 1K, 3BB), Alaina Francis, wp, (4IP, 3K, 0BB) and Conchetta Rinaldi. 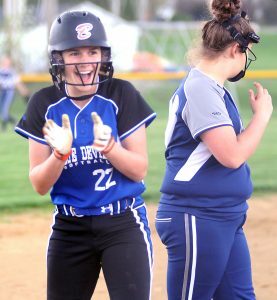 ALLIANCE — Laura Kohmann’s walk-off RBI single finished off Marlington’s three-run outburst in the bottom of the seventh inning as the Dukes rallied past Salem, 9-8, Thursday. Sarah Cunko also homered for Marlington. Salem pitcher Taylor Thorpe, who struck out 10, got hurt wild covering the plate in the seventh inning on a wild pitch. X-rays showed no broken bones. Elly Exline had four hits and two RBIs and Rylie Troy scored three runs and stole a base to lead the Quakers. Bailee Thorn, Meg Rossero, Jessica Slocum and Thorpe each had two hits.